Color - nothing can be done except remove and replace. Painting is usually a bad idea. The tile and grout joints look artificial. Paint peels. Tile and grout are not supposed to be the identical color. to build and protect gloss to a matching level. Color - An Aldon sealer designated "color enhancing" will tend to slightly darken the materials and disguise color differences. Gloss - Build and even out gloss with any Aldon sealer that creates gloss. See the Surface Types page. Next: If necessary to get a color stain to penetrate and adhere - use a higher strength of Aldon "Grout Residue Remover" to slightly etch the surface. 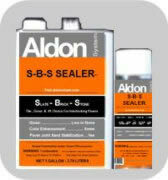 Next: Mix a solvent based stain from the paint store into Aldon S-B-S Sealer at the level that gives the needed results. S-B-S Sealer is a highly penetrating - low solids solvent based sealer that will best carry the color stain into the stone. It may be better to go lighter in color and use multiple applications to achieve the final color. Sometimes these procedures are a trial and error process. The cause of the problem might be different than thought, or have multiple causes and results that must be handled in steps. In some cases, it cannot be fixed. Proceed as though it is an experiment whose results must be evaluated. Any Aldon product usually has more than one purpose. It is not limited to only this project.